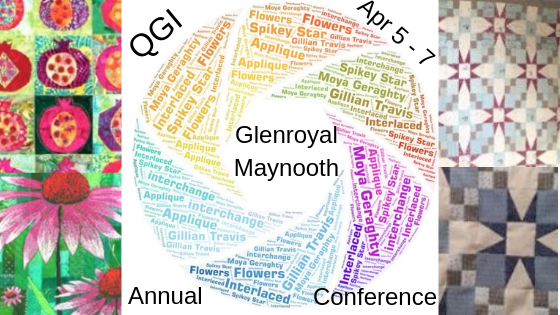 The Quilters Guild of Ireland invite you to join us at our annual retreat and conference! If you are a current or past member of the Quilters Guild of Ireland you should hopefully have received a letter from us inviting you to attend our annual retreat in Dublin next March. This year we are delighted to tell you the Crafts Council of Ireland are supporting our retreat with a generous grant. This is wonderful news for us and means we can offer classes and workshops at a much reduced cost. Robyn, our retreat coordinator, has put together a magnificant weekend package for us at an amazing price so we do hope you will join us. Friday 8th March 2013 and continue through to Tuesday 12th March. Please Note :- Sunday Lunch is NOTincluded. All classes are booked on a first come first serve basis so be sure to send your application form in asap!